It is predicted that air temperatures will rise by 1.4-3.9°C during the 21st century in this part of British Columbia, consequently increasing ocean and fresh water temperatures. Photo: © Gleb Raygorodetsky. Like other indigenous First Nation communities throughout Canada, the Tla-o-qui-aht people are survivors. Over a century of cultural genocide, Christianisation, forced assimilation, land alienation and re-settlement reduced their numbers tenfold and pushed them to the brink of extinction. But despite environmental, social and cultural upheavals, the Tla-o-qui-aht are slowly but surely strengthening their ability to cope with social and environmental challenges, including climate change. Last week, in Chapter 1 of this eight-part series, Adjunct Research Fellow Gleb Raygorodetsky of the United Nations University Traditional Knowledge Initiative arrived in Ha’huulthii — the traditional territory of the Tla-o-qui-aht that is widely known as Clayoquot Sound, British Columbia. He encapsulates the recent past and sets about visiting with the local people who will help us understand the challenges and triumphs the Tla-o-qui-aht people have faced. In this second chapter, master carver Joe Martin begins showing Raygorodetsky some of the most significant places in Ha’huulthii. At first, there is nothing. Just shades of gray. The grayness brightens in places only to dim moments later. Some lighter patches rise and merge, darker ones swirl and fade. They are enveloping and saturating, seeping into every pore of my exposed flesh. I glance down at my hands clenching the side of the boat. They appear solid, but feel cold and damp, and look drained of colour. Ahead, a darker shape precipitates out of this gray soup. With no reference points, it is hard to judge the scale — is it a smudge on my eyeglasses or an enormous mass looming ahead? The put-put-putting of the 90-horse outboard motor is almost inaudible in the thick fog as our 20-foot fibreglass fishing boat rides the glassy swell toward the obscure form ahead. “Echachist!” Joe Martin announces behind me, his voice muffled by the thick fog, as the shadow condenses into the recognizable shape of an island. I hear Enchanted! instead. Suspended above the ocean — like Laputa, the flying island of Myazaki’s “Castle in the Sky” — Echachist is swaddled in the rolling waves of dense morning mist. 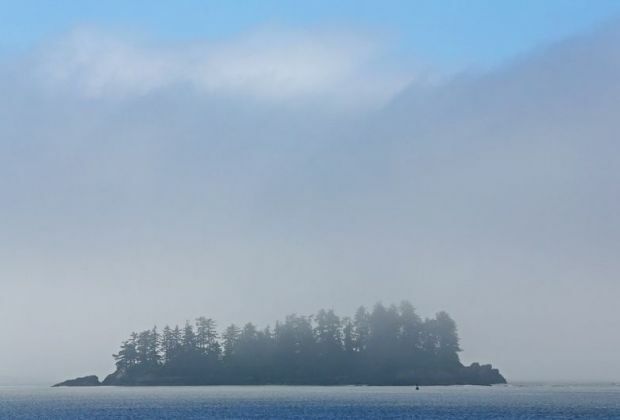 Islands of Clayoquot Sound are reluctant to get out from under the cover of morning fog. But later in the day, the summer sun often burns through the mist, and the light throws land and seascape into sharp, vibrant relief. Photo: © Gleb Raygorodetsky. The fog has enveloped us since early this morning when Joe first pushed his boat away from a dock in Tofino — a nature lovers’ mecca. The town’s small resident population swells tenfold as the whale watchers and anglers, surfers and bird watchers, kayakers and storm trackers flock here throughout the year from around the world. Like a kid lingering in bed, pulling the quilt over her head when it’s time to rise and get ready for school, Tofino is always reluctant to get out from under the cover of morning fog. But later in the day, the summer sun often burns through the mist, and the light throws land and seascape into sharp, vibrant relief. Joe is certainly counting on that today. From under a full head of thick black hair with only a few streaks of white at his temples, Joe’s penetrating dark eyes quickly scan the distance between the boat and the emerging coastline. Standing behind the navigation console, his sinewy frame wrapped in a bright red flotation jacket, Joe slowly turns the boat’s wheel, cautiously guiding the vessel around large rafts of bull kelp toward the island, its craggy coastline now in full view. In a few minutes we reach a rocky point on the island’s southeastern shore that forms a natural breakwater, sheltering a sandy beach on the opposite side. Several feet from the rocks, Joe kills the motor and nimbly runs to the front of the boat to grab a mooring buoy bobbing on the surface among the bladders of the bull kelp. 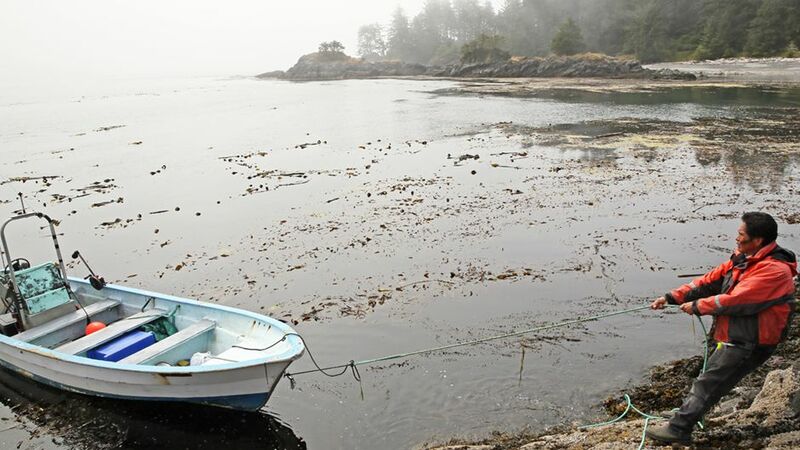 With few slashes of his fishing knife, he clears a patch around the boat from the kelp’s blades and stipes, or stems, to make it easier to secure the boat to the mooring line with a few deft knots. Joe jumps onto the rocks and holds the boat for me to climb out. “Welcome to Echachist, the home of Tla-o-qui-aht people,” he says and then adds grinning, “And my home!” Where Echachist’s ancient forest reaches the beach, stands a house that Joe built over 20 years ago. Joe jumps onto the rocks and holds the boat for me to climb out. “Welcome to Echachist, the home of Tla-o-qui-aht people,” he says and then adds grinning, “And my home!” Photo: © Gleb Raygorodetsky. It is the middle of July now, the peak of tourism season, and Vancouver Island is on its way to breaking a record of consecutive days without rain, one of many signs that the weather and climate are drifting away from their historical norms. Air temperatures are predicted to rise by 1.4-3.9°C during the 21st century in this part of British Columbia, consequently increasing ocean and fresh water temperatures. 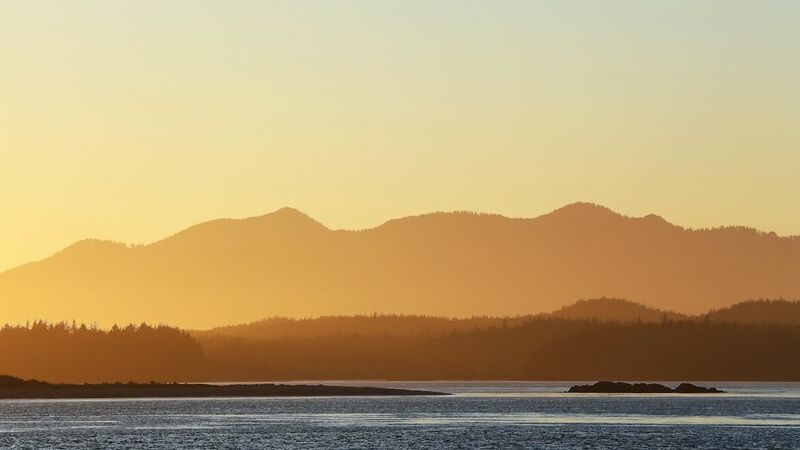 According to the Ecotrust Canada’s report “Climate Change Adaptation in Clayoquot Sound”, the summers on the Island are predicted to be drier, while winters will see more rain but less snow. Less summer rain will make fresh water a precious commodity here during the warm months, even though it is one of the wettest places in North America. And the winter storms will continue to get stronger, pummeling the Clayoquot coast more often, as the sea level continues to inch up the shoreline, eating it away. I want to understand what these new transformations mean to the Tla-o-qui-aht people in the context of past changes they have experienced—from abrupt social shakeups, like assimilation into industrial society and epidemics; environmental changes, such as deforestation and overfishing; and significant climactic shifts, like warming air and water, and sea level rise. 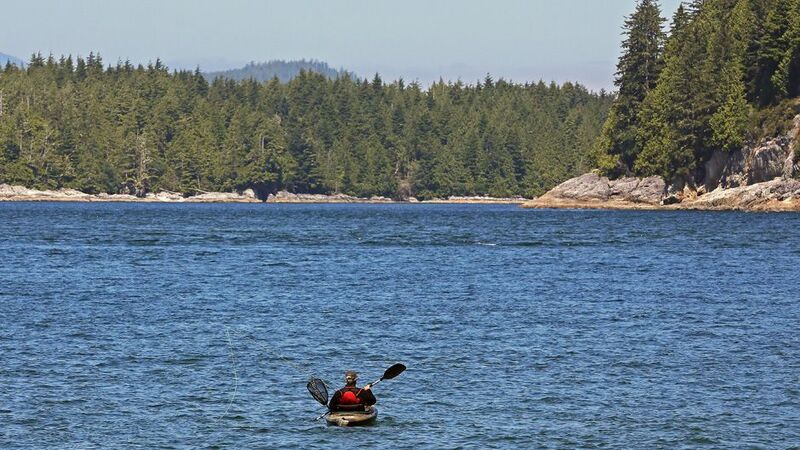 Tofino’s small resident population swells tenfold as the whale watchers and anglers, surfers and bird watchers, kayakers and storm trackers flock here throughout the year from around the world. Photo: © Gleb Raygorodetsky. Over the next few days, I hope to learn from Joe and his Tla-o-qui-aht relatives and friends, like his nephew and the Tribal Parks Co-Director, Eli Enns, and a Tribal Parks Guardian, Cory Charlie, how they are navigating this new set of challenges not of their own making. But to even begin a conversation about the new challenges, I first need to reacquaint myself with the place and the people. So, today, Joe is taking me to some of the most significant places in Tla-o-qui-aht people’s territory around the Sound. Coastal temperate rainforests, like those of Clayoquot Sound, are as breathtaking as they are unique. Covering less than one percent of the planet’s land surface along the coasts of western North America, New Zealand, Tasmania, Chile, and Argentina, these forests are rare and getting more so, as the timber industry continues to log the old growth woods, even though at reduced rates. A 60-mile stretch of Vancouver Island’s west coast is one of the few remaining places on Earth where such rainforests endure. The giant western hemlocks, Douglas firs, western red cedars and Sitka spruce are some of the Earth’s most ancient living beings. Over a thousand years old and reaching 300 feet tall and 60 feet in girth, these giants have stood witness to the region’s history, both ancient and modern, geological and ecological, natural and human. The very presence of the old-growth rainforests here along the coast signifies that fundamental shifts in the Earth’s environment had taken place, for the trees could only take root when the glaciers and the sea had retreated as the climate had warmed. Please visit Our World again next week for the next story in The Tla-o-qui-aht People and Climate Change series. This article is part of the Healing the Earth project of the Conversations with the Earth (CWE) initiative, a multimedia platform that brings indigenous voices on climate change to the global audience. It is supported by Land is Life. Follow CWE on Facebook or Twitter @ConversEarth. The Tla-o-qui-aht People and Climate Change: Chapter 2 by Gleb Raygorodetsky is licensed under a Creative Commons Attribution-NonCommercial-ShareAlike 4.0 International License. Photos: © Gleb Raygorodetsky. Dr. Gleb Raygorodetsky is an Adjunct Research Fellow with the Traditional Knowledge Initiative of the United Nations University Institute of Advanced Studies (UNU-IAS) and a Research Affiliate with the POLIS Project on Ecological Governance at the Centre for Global Studies, University of Victoria, Canada. Gleb is a conservation biologist with expertise in resource co-management and traditional knowledge systems. Prior to joining UNU-IAS, Gleb led the development of a new global grant-making strategy for the Christensen Fund on biocultural diversity and resilience. Gleb works in the field of biocultural diversity with a focus on participatory research and communication, indigenous rights, climate change mitigation and adaptation, and sacred natural sites. Gleb co-chairs the Ethics Program for the International Society of Ethnobiology (ISE) and is an active member of the IUCN Specialist Group on Cultural and Spiritual Values of Protected Areas (CSVPA). Gleb has contributed to such magazines as Cultural Survival, Alternatives, Wildlife Conservation, and National Geographic, writing about climate change, traditional knowledge, and Indigenous peoples.